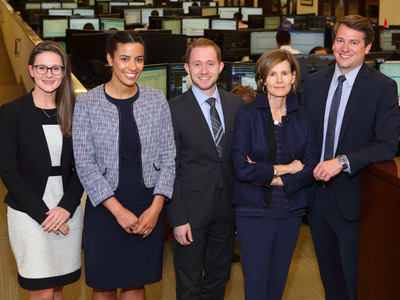 BlackRockJoshua Kazdin, center, with members of BlackRock Impact as well as Zaneta Koplewicz, who helped spearhead the group but now works for BlackRock’s event driven team. Impact investing — that is, investing with a cause in mind — is becoming increasingly popular. Millennials are twice as likely to invest in companies that have a positive impact on society, and that generation is set to invest around $40 trillion over the next three decades. he market for green bonds, where the proceeds are used for environmentally friendly projects, is booming. The problem for these kinds of investors and investments is the lack of data to measure environmental impact. Most data on environmental, social, or governance factors comes from a single source: reports from the companies themselves. Finding new data to make sustainable outcomes measurable — and increasing the transparency around how that data is reported and measured — is key. BlackRock, the world’s largest investor with $4.6 trillion in assets, is working to address that very problem. The company’s Impact team has partnered with its scientific active equity, or SAE, to pull together new insights on the impact of their investments. “There was this massive problem in the marketplace: Can we reasonably measure the environmental and social consequences of our investments?” Joshua Kazdin, a San Francisco-based vice president in SAE who works with BlackRock Impact, told Business Insider. That could mean, for example, pulling patent data across the globe to find out which companies are focusing on environmental and sustainable technologies like waste treatment or alternative energy. Or it might mean examining how companies treat their employees, based on data from social media websites like Glassdoor. Kazdin’s team scrapes data on clinical trials from a government website, and maps estimates for disease burden using data from a University of Washington website in order to identify the highest-impact companies. They weigh total clinical trials and research and development at various companies, and compare that with others within their size cohort, to make an investment decision. The alternative data Kazdin collects is used like any other signal to build a portfolio. One product Kazdin’s team helped create is the Impact US Equity Fund, BIRAX, which invests in a portfolio of equity securities with “postive aggregate societal impact outcomes,” according to the firm. BIRAX’s holdings include the tech companies Apple, Microsoft and Alphabet, the banks JPMorgan and Wells Fargo, and the pharmaceuticals Pfizer and Johnson & Johnson. “To be able to break the wall between who you are and what your money does in the world is a great service that we can provide to our clients,” Kazdin said. Measuring alternative data points like the ones Kazdin evaluates also adds value to the investment process in the form of additional data points that are useful in making better long-term decisions. How well a company treats its employees, for example, might have an effect on that company’s productivity. Maintaining a poor carbon-emissions track record can also come back to haunt companies, and their shares, down the road. That was the case with Volkswagen earlier this year, which was caught cheating diesel emissions tests and has since seen a significant decline in car sales as well as becoming embroiled in a costly legal battle. Its stock is down 44% in the past year. This kind of data collection is just the beginning. “Over time, the data and analytics will improve exponentially,” BlackRock global head of impact investing, Deborah Winshel said.